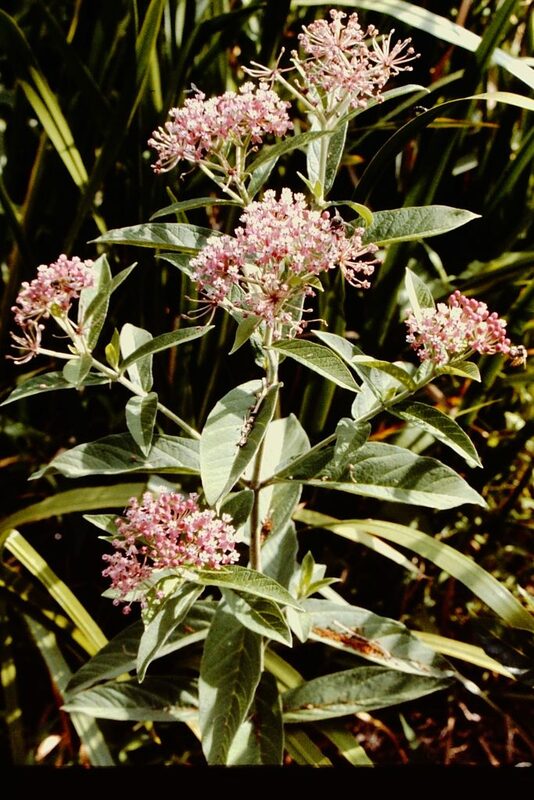 Asclepias is a perennial herbs from a thick root, or vertical root crown, sap is a milky, thick latex, (except A. tuberosa) often containing toxic cardiac glycosides (chemically a sugar and steroid combined). Leaves opposite to whorled (alternate in A. tuberosa). 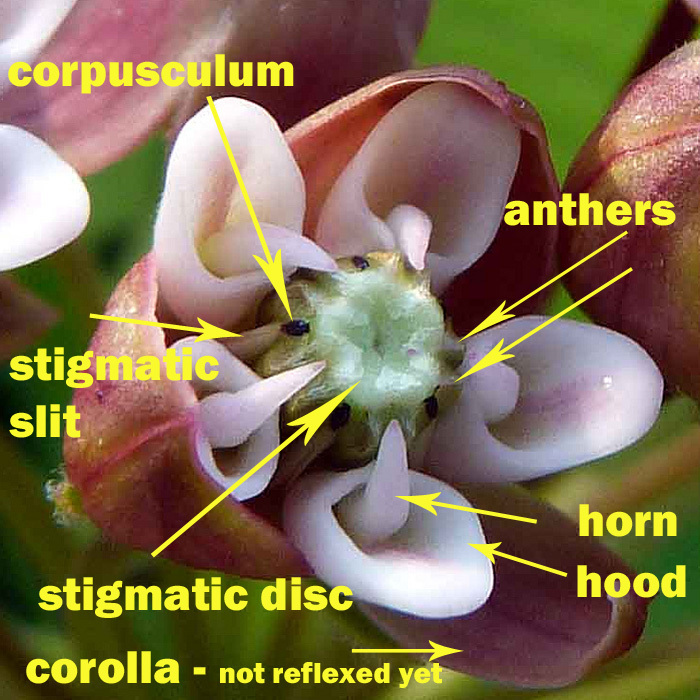 Asclepias syriaca ( Milkweed Common) flower parts. Photo © Belinda Beethan (Native Plant Society of New Jersey) 6/20/2012. Showing close up of flowers (Accessed 8/2017). Asclepias flower.botany.Center for the Study of Digital Libraries Texas A&M University. csdl.tamu.edu Accessed 12/2014). Flowers radially symmetrical, 5-parted, petals (corolla) fused at base, petal lobes usually reflexed sharply backward; stamens fused around style into a central column, anther tips triangular, column sheathed by a ring of five petal-like “hoods” often with a horn-like structure inside each hood, the entire central structure called the “corona,” a signature structure of Asclepiadaceae; pollen stuck together in two masses (pollinia) connected by a strap of tissue, not visible from outside of flower; ovary superior; stigma large (Yatskievych 2006). 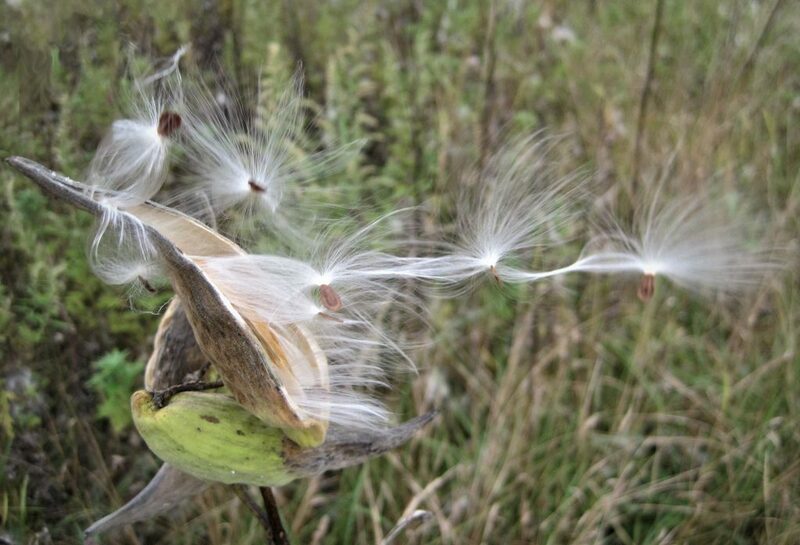 Fruit dry, linear to oval pods, tip pointed, usually held erect; eventually splitting open lengthwise to release numerous plumed seeds. 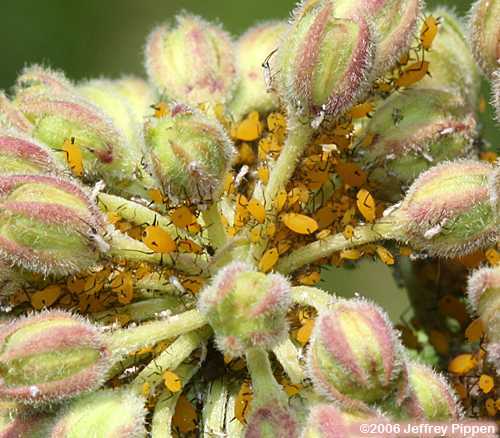 Asclepias syriaca (common milkweed) with Aphis nerii (Milkweed aphid). © 2006 Jeffery Pippen. jeffpippen.com (Accessed 10/2017). Notes: Pollen is dispersed when the pollen mass (pollinia) strap becomes tangled on the legs of bees or other insect visitors (Conrad 2006). 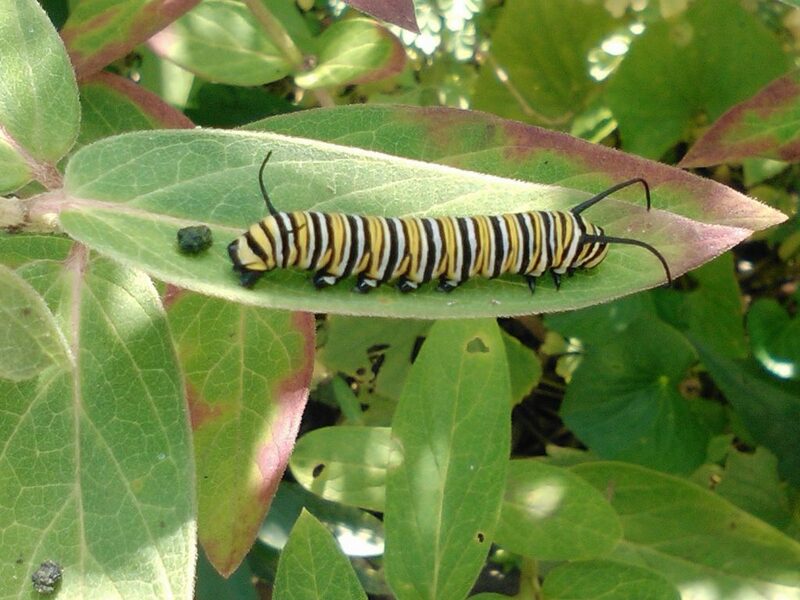 Plants are eaten by larvae of monarch butterflies (Danaus plexippus), and also by the milkweed tiger moth (Euchaetes egle), which store cardiac glycoside toxins, making them unpalatable to birds (Brower and Brower 1964; Brower 1972). 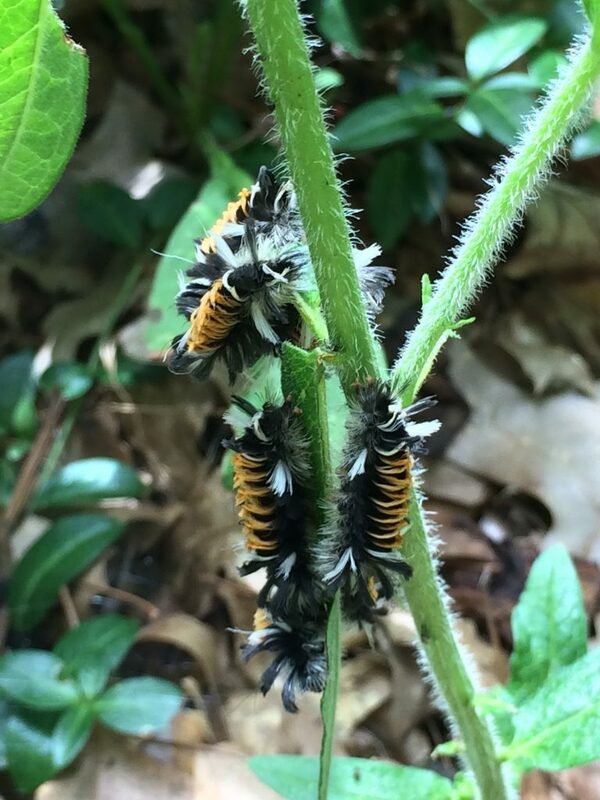 Parasitized by the bright orange Oleander aphid Aphis nerii, that sequesters cardiac glycosides present in milkweeds. This insect is in turn parasitized by a braconid wasp, Lysiphlebus testaceipes, (McAuslane 2001). Fed on by Tetraopes tetrophthalmus the milkweed long-horned beetle.